Merrell Bare Access Ultra - To Buy or Not in Apr 2019? The Merrell Bare Access Ultra is a light road shoe that delivers a barefoot-like running experience. The zero-drop shoe is a good choice for runners looking to transition their foot strike or want to try out a smaller heel to toe drop. Runners who want to be closer to the ground will appreciate the Bare Access Ultra’s design. It’s a lightweight shoe that can go for miles but is also great for a run around the track. The shoe is nice and flexible and most runners found that slipping on the shoe felt similar to slipping on a sock. If you’re curious about a more minimalist shoe, the Merrell Bare Access Ultra might be a good shoe to try out. It still has a good amount of padding underfoot and manages to remain light with a natural feel. Merrell also notes that the shoe has a vegan-friendly construction, meaning that no animal products were used creating it. This shoe is a great option for those looking to enter into the world of minimalism. Those who wish to get closer to the ground and run in a shoe that offers a more natural feeling will find the Merell Bare Access Ultra provides them with all that and more. Some runners found the midfoot too snug. Some runners commented that the outsole didn't last long. The Merrell Bare Access Ultra features a Vibram outsole which makes the shoe's sole durable but also allows the shoe to maintain flexibility. The lugs on the outsole are capable of withstanding some use on trails. They are able to grip nearly any kind of terrain with the exception of super technical trails. The Vibram sole also does a good job of keeping the wearer stable when the rain decides to fall on a cloudy day. 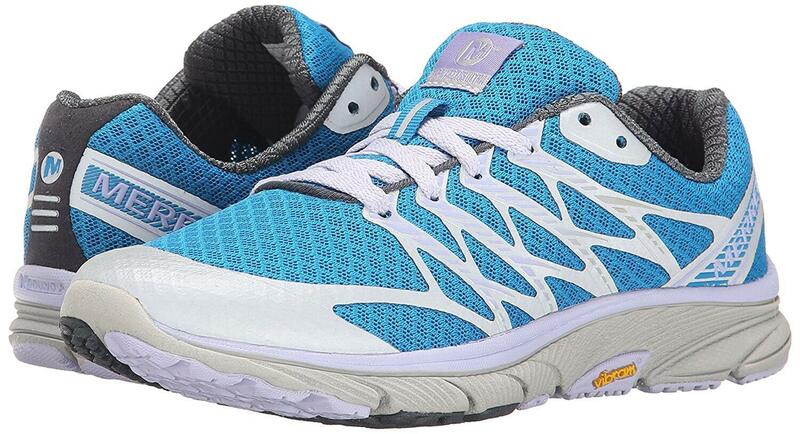 The Merrell Bare Access Ultra's M Bound DST midsole offers up a good amount of cushioning. It's composed of EVA and other patented materials. The cushioning runs the length of the shoe and is nice and responsive. The midsole provides energy return with each foot fall. Despite being a minimalist shoe, the Bare Access Ultra can handle long distances thanks to its cushioned midsole. Runners will find that they can get a natural ride out of the shoe and still feel protected underfoot. The mesh and TPU upper of the Merrell Bare Access Ultra mean that the shoe is breathable and will work well in hot conditions. The shoe also contains an inner lining that's been treated with a special odor control substance called M Select FRESH. This helps to eliminate unwanted smells after particularly sweaty runs. The interior is nice and soft, adding to the comfort of the shoe. The upper also features synthetic overlays which secure a runner's foot inside the shoe. Inside, runners will find that the shoe is almost seamless which helps to eliminate any possible hot spots that might occur. Runners might even feel comfortable going sockless in the Bare Access Ultra. The Merrell Bare Access Ultra weighs 6.8 ounces. However, the lightweight construction doesn't mean that the shoe is flimsy. The Bare Access Ultra can handle long distances with no problem. The midsole contains a decent amount of cushioning. The lightweight construction coupled with the ample cushioning makes the Bare Access Ultra a good race day shoe choice. At first glance, the shoe doesn't look as light as it actually is. The cushioned midsole appears as a nice chunk of material that brings runners a little bit off the ground. Runners commented that this slight platform worried them at first, but after wearing the shoe, they didn't feel unstable or too far from the ground at all. The upper on the Merrell Bare Access Ultra does a good job at ventilating. The mesh allows air to circulate and reduce excessive perspiration. The interior of the shoe also features M Select FRESH which helps to control odors that occur as a result of sweating, a welcomed feature by many runners. Many runners commented that the fit of the Merrell Bare Access Ultra felt like slipping on a sock. The toe box is a bit wider than the rest of the shoe giving a runner's toes room to splay out naturally. The roomy toe box also reduces the chance of blisters forming on the toes. If you've ever had issues with black toenails, a larger toe box might help alleviate some of the pressure causing the issue. The midfoot of the Bare Access Ultra is a bit narrower than some runners would have liked. Runners with wide feet will likely find the shoe is too tight in the midfoot area and may want to opt for a different shoe. 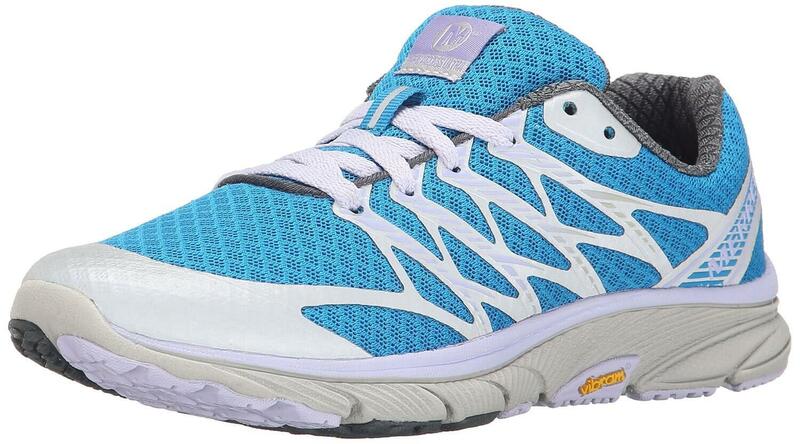 The Merrell Bare Access Ultra is a nice looking shoe. It has the looks and trappings of a trail shoe in a lighter package but is made for the road. The shoe offers up some color but the choices are not overly flashy. The Bare Access Ultra looks like a rugged shoe that can handle a lot of demanding training. It almost looks heavier than it actually is but don't be fooled, this is a lightweight shoe that can go the distance. The Vibram outsole on the Merrell Bare Access Ultra is long lasting, but some runners did comment that the sole showed signs of wear much quicker than they had hoped and anticipated. It's surprising since Vibram soles usually tend to last quite a while. The Merrell Bare Access Ultra is a lightweight shoe that provides runners with a nice flexible and responsive ride. But what about protection for the joints? The shoe might be lightweight, but it still has a well cushioned midsole. The full-length M Bound DST cushioned midsole offers protection for a runner's body whether they are pounding out repeats on a track or heading out for their Sunday long run. The shoe also features reflective sections on the upper to ensure runners are visible in low-light conditions. The Merrell Bare Access Ultra is a nicely responsive shoe. Coupled with its lightweight construction, it's a great shoe to take out for intervals on the track. Runners will enjoy a good amount of energy return while running in the Bare Access Ultra. Some heavier runners might find the energy return is lacking. Still, most runners found their ride in the shoe was zippy and efficient. While the Merrell Bare Access Ultra is a neutral shoe, runners still found that the shoe was supportive enough underfoot. Runners did not find the shoe had a sloppy fit. The Bare Access Ultra fits snugly around the foot and keeps runners grounded. Though it's lightweight and flexible, the shoe is not at all flimsy. There is also ample arch support which some runners found great but others found the arch was a bit too rigid for their liking. The Merrell Bare Access Ultra was made for the road and it does a good job at handling varied road surfaces and runs at the track. The shoe is also able to handle moderately technical trails thanks to its grippy Vibram outsole which features tough lugs that can handle virtually anything, except highly technical trails. Runners tested the shoe out on various surfaces including gravel and dirt trails and they found that the shoe did a good job with traction and protection. The Merrell Bare Access Ultra has a price tag of about $100. It's an older shoe so most places that carry it will offer it at a discount. The price tag is well worth it considering it can be used in a wide array of training situations and on a wide array of terrain. The Vibram outsole on the Merrell Bare Access Ultra provides excellent grip on the road or at the track. The shoe can also handle some trail running thanks to the outsole's tough construction. The Vibram outsole also does a good job keeping runners moving forward even in rainy and wet conditions. The sole can function in a variety of conditions which just goes to show how versatile the Bare Access Ultra really is. Rain or shine, road or trail, this shoe has got you covered, cushioned and running comfortably. The Vibram outsole of the Merrell Bare Access Ultra allows for ample flexibility. Runners won't feel like they are running in a rigid shoe. The Bare Access Ultra moves with the runner. A run in the Bare Access Ultra feels natural, comfortable and like running without any shoes at all! The high amount of flexibility doesn't mean that the shoe is sloppy though. The cushioning provides some support and runners liked the snug fit of the shoe. The Merrell Bare Access Ultra is not a stability shoe by any means. It's a neutral shoe for runners who are either forefoot strikers or who do not have issues with overpronation. Still, runners will find they are firmly supported while running in the Bare Access Ultra. The full-length cushioning does a good job at offering support underfoot, especially in the arch and midfoot areas. Some runners did not like the excessive arch in the Bare Access Ultra. They found it protruded too much and negatively affected their gait. Runners also commented that the shoe fits like a sock and kept them moving forward in an efficient and supportive manner. The heel to toe drop in the Merrell Bare Access Ultra is 0mm. This makes the Bare Access Ultra a zero drop shoe. The natural, barefoot running-like feel of the shoe is one of its biggest draws. It offers an option to runners looking to transition to a less cushioned, more grounded running shoe. The barefoot-like feel is supplemented by some degree of cushioning which makes the shoe appropriate for both long distances and intervals. With the Merrell Bare Access Ultra, you get the best of both worlds. The shoe offers a barefoot-like feel with a zero heel to toe drop. It also offers a good amount of protection underfoot. The shoe is perfect for runners looking for a more natural running shoe who don't want to sacrifice comfort and cushioning. The Bare Access Ultra is a great lightweight shoe that can be used for long distance training and speed work. The fact that it's vegan is a bonus that some runners might appreciate as well. The Bare Access Ultra is definitely a versatile shoe that just might outshine the rest of those old runners in your closet.